Our Clearinghouse Connections series offers you a more intimate look at the National Student Clearinghouse by introducing you to our people and the work they do. Today, meet Samantha Hanson, who works as a Product Manager for Transcript Services at the Clearinghouse. A: I started at the Clearinghouse six years ago as as a Customer Service Representative I. Within a year, I worked my way up to Customer Service Representative II, and then transitioned over to the Implementation team, where I held several roles including specialist, coordinator, and senior coordinator. During my time spent in Customer Service and Implementation, my interest and knowledge on Transcript Services developed and became my specialization, which presented a new opportunity to transition into Transcript Services as an Integration Specialist. In this role, I worked with eTranscripts, Peoplesoft, Generic API, and hosted integration implementations, further developing my specialization in Transcripts, which allowed me to move in the Product Manager role for Transcript Services. Q: What does a day in the life of a Product Management Specialist entail? A: When we don’t have a huge project that we’re releasing like The Next Generation Transcript Experience, our team does many things to enhance our product. We start by learning our clients’ needs and where they are headed. From there, we develop and maintain our product’s roadmap. We also work with the business analysis and development teams on what is going to be included in the next release, which typically includes grooming stories, reviewing backlog items and prioritizing, and planning the next sprint. In addition, we support the Customer Care and Business Development teams by creating and maintaining internal and external documentation, presentations, and collateral. Q: What was it like to work on a huge project like The Next Generation Transcript Ordering Experience? A: Exhilarating, exhausting, exciting. We had to be very organized to make sure all the moving pieces got completed and were completed at the right time. Q: What was the biggest challenge of that project? A: Not being the Product Manager on the project from the beginning of the project. Because I didn’t fully start my role as Product Manager until April 2018 after the project was underway, the project was led by another Product Manager until August when I took over. So, I didn’t get to provide my input from the start throughout the design and development process. Q: What do you expect the Transcript Services Product Management team to provide the education community in the coming year? A: We’re working on developing an easier way for admissions offices to request and receive transcripts and add them to the students record for a quicker and more streamlined acceptance process. A: I love to travel to new places, go to the beach, visit local wineries, spend time with friends and family, cook, and many other fun things! 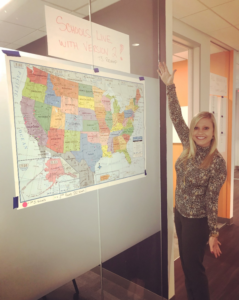 Samantha Hanson, product manager for Transcript Services at the Clearinghouse, proudly displays a map of schools that have transitioned to the Next Generation Transcript Experience .